On Skin: Lemon grass oil is an effective cleanser for all skin types; its antiseptic and astringent properties makes lemon grass oil perfect for getting even tone and glowing skin while also helping skin firm up and minimizes skin pores. On Hair: The oil helps strengthen hair follicles and helps in controlling hair loss. On Mind: The calming and fresh lemony aroma acts as a natural deodorizer and gets a refreshed and energized feeling.The lemont aromatic oil is one of the best homemade insect repellents to ward-off mosquitoes, flies and other irritating bugs. 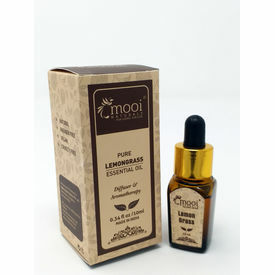 100% pure natural steam distilled Lemongrass Oil extracted from the fresh/dried leaves of Cymbopogon Flexuosus (Lemongrass) Mind,Body & Sprit: On Skin: Lemon grass oil is an effective cleanser for all skin types; its antiseptic and astringent properties makes lemon grass oil perfect for getting even tone and glowing skin while also helping skin firm up and minimizes skin pores. On Hair: The oil helps strengthen hair follicles and helps in controlling hair loss. On Mind: The calming and fresh lemony aroma acts as a natural deodorizer and gets a refreshed and energized feeling.The lemont aromatic oil is one of the best homemade insect repellents to ward-off mosquitoes, flies and other irritating bugs.